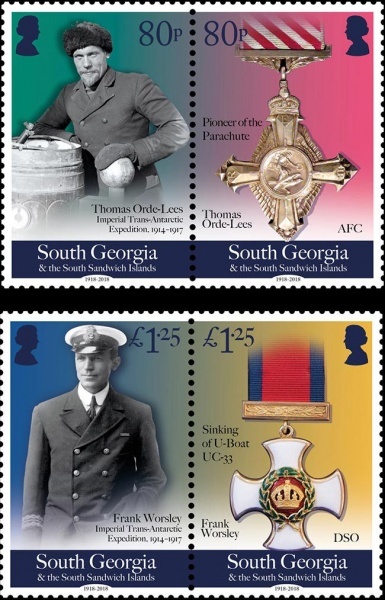 The Government of South Georgia & the South Sandwich Islands is delighted to announce the release of it’s latest set of stamps which commemorates the centenary of the end of World War I and the role Shackleton’s men played in the conflict. This set is part of a complementary issue of stamps with the British Antarctic Territory to mark this milestone anniversary. Sir Ernest Shackleton’s plan for the Imperial Trans-Antarctic Expedition was audacious and, to some polar experts, foolhardy. One party, aboard the Endurance, would sail to the southern coast of the Weddell Sea and set up a base with six of the men then setting out on a 1,500-mile journey across the continent, via the South Pole, to another base on the coast of the Ross Sea. On the way they would pick up supplies set out for them by a party from the Ross Sea base that had landed from the Aurora. Both halves of the expedition faced near disaster. Endurance was crushed in the pack-ice and the crews fight for survival and eventual rescue has become legendary. On the other side of Antarctica, Aurora was trapped in the ice and barely made her way back to New Zealand, having left 10 men stranded ashore. Despite enormous hardships, and the deaths of three men, they managed to lay the depots of food that would have been vital for Shackleton and his crossing party. The onset of World War I meant that the expedition nearly did not take place. On 3 August 1914, as Endurance was about to depart, Germany declared war on France and Britain mobilised her forces. The immediate effect on the expedition was that three members left to rejoin their units. Shackleton cabled the Admiralty in London offering Endurance and her complement. The First Sea Lord, Winston Churchill, replied ‘Proceed’ and, with the backing of King George V, Endurance set sail for Antarctica on 8 August. There was criticism at home that Shackleton and his men should be fighting for King and Country rather than ‘messing about on icebergs’. Shackleton countered that they were engaged in the ‘White Warfare of the South’. As proved to be the case, the expedition was sometimes as fraught with danger as facing enemy fire. When the men returned to civilisation, they found the world was still at war. The war with Germany had been expected to be short-lived but, three years later, it continued to engulf Europe. Almost to a man, the explorers joined the armed forces or returned to their previous lives in the Merchant Navy. Even Perce Blackborow, despite having the toes of his left foot amputated on Elephant Island, joined the Merchant Navy. Some made the ultimate sacrifice for doing so. Tim McCarthy was killed when his ship was torpedoed. Alfred Cheetham and Ernest Wild, Frank Wild’s brother, also died at sea. James McIlroy, James Wordie and Clarence Mauger were badly injured. At 42 years of age and too old for conscription Shackleton was gazetted as a temporary Major and joined Syren Force, a multinational force sent to Murmansk in northern Russia, first to defend it against the Germans and then, after the Armistice, to support the White Russians against the Red, Bolshevik, forces. His task was to organise winter equipment and he was joined by Alexander Macklin, Leonard Hussey, Joseph Stenhouse and Frank Worsley. the Western Front. He became an active proponent of the use of parachutes. To convince military commanders of their practicality and value, Orde-Lees jumped, headfirst, from the top of the Tower Bridge into the River Thames, barely 50 metres below. He later made low level descents from aircraft to demonstrate parachutes at home and abroad. Orde-Lees was awarded the Air Force Cross for this pioneering work. Frank Worsley, a New Zealander and a veteran of sailing ships, was appointed captain of Endurance. He has become famous for navigating the James Caird from Elephant Island to South Georgia. A member of the Royal Navy Reserve, he was given command of the ‘mystery ship’ PQ61 and sank the U-boat UC33 by ramming, for which Worsley was awarded the Distinguished Service Order. In 1918 Worsley joined Shackleton in northern Russia and helped organise equipment and stores in Archangel.